The GENSOM project is a 2-year research collaboration between PRIO and HIPS, funded by the RCN. The project aims to understand present-day Somali women’s civic and political engagements through a historical lens. It studies the history of women and power in Somalia; the level of access women have to formal and informal arenas of power; and the influence that women have in Somali society, particularly in relation to gender issues. Data will consist of life histories, semi-structured interviews and focus groups conducted in Mogadishu, Hargeisa, Garowe, and with diaspora women. 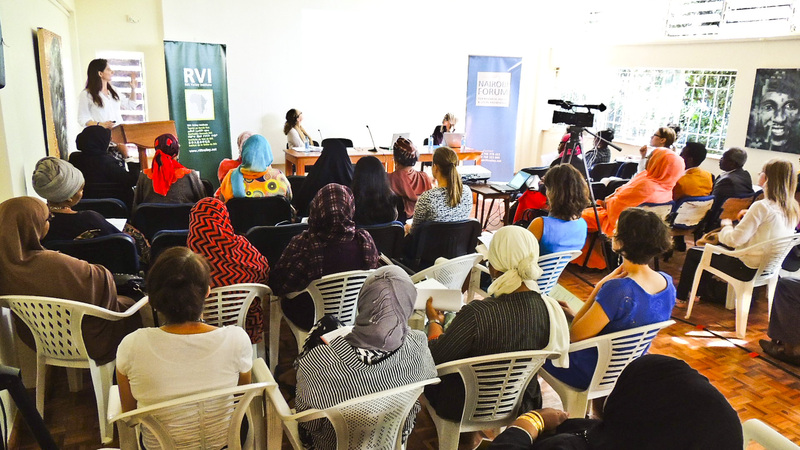 On February 6th the Peace Research Institute Oslo (PRIO), in partnership with the Heritage Institute for Policy Studies (HIPS) and the Rift Valley Institute (RVI) hosted a conference titled “Somali Women’s Civic Engagement: Past, Present and Future”. The conference was organized as part of the research project ‘Gender in Politics in Somalia: access and influence in a post-conflict state’ (GENSOM), and was funded by the Research Council of Norway (RCN) and the Somalia Stability Fund (SSF). The interactive conference took place in Nairobi at the British Institute, and brought together women and men interested in learning about Somali women’s civic and political engagements. The participants consisted of prominent Somali civically engaged individuals, politicians and journalists as well as representatives of the donor community, UN and NGOs based in Nairobi. The conference was divided in two sessions: the morning session was a closed event that focused on presenting preliminary findings of the GENSOM project which were further discussed in three parallel workshops. The afternoon session was open to the public and screened a preview of the GENSOM documentary film followed by a panel discussion. The conference was opened with a powerful poem, ‘I am a Somali woman’, written and performed by Sahro Koshin, who is a writer and advocate from Puntland and a researcher on the GENSOM project. Cindy Horst, research director at PRIO and leader of the GENSOM project, provided an introduction to the project. She devoted her time to explaining why and how the project largely uses the life history method, and illustrated the power of life histories through a number of quotes that reflected women’s experiences in conflict and displacement. Laura Hammond, head of the Development Studies Department at the School of Oriental and African Studies (SOAS), University of London, then presented a brief background of Somali women’s political and civic roles in the last few decades. This introduction served to illustrate that Somali women, though often not visible in historical accounts, played a major role in society throughout time and had faced a range of opportunities and constraints in different time periods. Maimuna Mohamud, lead researcher for HIPS on the GENSOM project, then presented the audience with preliminary findings. She illustrated how the research broadens the narrative of civic and political engagement by including women in the writing and telling of Somali history. A first finding, then, is that writing and storytelling can be an act of civic or political engagement that women take on; whether consciously or not. Some older women write or recollect their experiences in order to address their own exclusion from Somali history and that of women more generally. Other, mostly younger, women write because it allows them to convey messages and be heard in society. Both groups of women are role models and sources of inspiration for other women. Secondly, the research shows that the women interviewed have contested perspectives on their role and status in the Somali society and on how that role evolved since the war. A number of women refer to the pre-war period as the ‘Golden Age’ where women had equal rights in the social and political context of Somalia; even though those rights were championed by the Siyad Barre military government and opposition was brutally repressed, doing the women’s movement considerable harm. These women argue that women’s rights have been reversed in present-day Somalia, referring to the impact of the war and the changing role of religion. Other women, however, maintain that women nowadays have more access to civic resources such as education, citizenship and livelihoods than in the past. They point out that the women’s movement of the past only benefited a small group of women. This brings us to the third preliminary finding presented, namely that ‘Somali women’ are not a homogenous group since the experiences of individual Somali women are impacted by many more aspects than their female identity. Women have and highlight different parts of their identity, such as their clan, region of origin, urban or rural background, level of education and diaspora background. Different aspects may be important at different times, and all will impact women’s ability and motivation to engage in Somali society. The presentation of findings was followed by dynamic discussions moderated by Dr. Hamdi Mohamed. Participants signed up for one of three parallel workshops, on the themes of history, access and influence. The workshops were participatory in nature and were set up to facilitate genuine discussion – based on personal experiences – between different groups of ‘stakeholders’, including women and men; Somali and non-Somali; working for governments, UN and civil society. Their aim was to enable participants to leave the room with innovative ideas, new perspectives and useful contacts. In workshop 1, on the history of Somali women’s civic and political engagement, participants inter alia explored the impact of the Somali civil war on civic engagement. They argued that, with the collapse of the state and the erosion of the system of customary law and governance, it has become the responsibility of ordinary women and men to provide community care and services like education and health. At the same time, the war has sharpened a range of divisions in society and older participants felt that the strong sense of individual responsibility that was instilled on them by their parents and the educational system may no longer be present. In workshop 2, on the resources and access to civic and political engagement, participants discussed some of the obstacles to greater participation in both formal and informal political action. They asked how to bring women together more effectively, as they saw great potential to create alliances. Such alliances could be between so-called minority women and those who belong to ‘majority’ clans; between businesswomen – many of whom are very powerful – and those involved in political action; and between diaspora and local women. One of the principle obstacles to women having greater access to formal political positions is, participants observed, the notion of clan democracy whereby clan elders select individuals to represent them. Whether because women are not seen as being reliable protectors of clan interest, or because women’s contributions are not valued, they tend to be marginalised from such a system. Participants were also wary of focusing exclusively on women’s inclusion in formal political process. They noted a need to recognize the plurality of women’s motivations and interests, and to approach the subject of women’s access from the point of view of creating space for women to choose the kind of involvement they want to pursue. Some women may decide to focus on service to their family or community; others may seek formal political office, while others may become active in civil society or business. It is important for women’s solidarity that all of these choices should be valued equally. Workshop 3 focused on the influence of women in leadership positions, exploring what it means to make a difference as well as how it is possible to do so and what challenges women and men face when trying. Participants identified social resources like support networks, role models, information; communal resources like freedom and education; as well as individual resources like courage, empathy, the will to make a difference and trust as crucial for making a positive difference in people’s lives. One of the main themes of the discussions centred around the question of power and influence, and the distinction between convincing people and imposing one’s will on them, or between ‘power over’ and ‘power with’ or ‘power through’. It became clear from the discussions that this distinction is not always easy, and that for example donors and diaspora struggle with this, since ‘free choice’ may be seen to depend on education and information yet knowledge is not neutral and donors as well as diaspora are often accused of imposing foreign (western) ideas. In the afternoon, the public event started with the screening of the preview to the documentary “Gender and politics in Somalia: access and influence in a post-conflict state”, by Abdiaziz Elmi. In the documentary several female politicians and civically engaged women shared their views on women in politics, social and communal affairs. Various women in the documentary were also in the panel for the open discussion of the conference, moderated by Laura Hammond. The panel started with the former minister of Women Development and Family Affairs in Puntland, Asha Gelle, who spoke of the importance of political participation of women as well as women’s rights. Asha Gelle is currently a chairwoman of the Independent Review Commission on the Constitution. Fawzia Aden, former Minister of Foreign Affairs and Deputy prime Minister of the Federal government in Somalia, then shared her experiences of holding a high profile ministry while being a woman. She argued that women needed confidence to actively engage in politics, and encouraged women to take the route of party politics rather than trying to go through the clan system. Dr. Maryan Qasim, former Minister for Women’s Development and Family Affairs in the Federal Government of Somalia, highlighted that civic engagement does not only imply engaging in politics or being a visible social activist. She argued that raising children that will later contribute positively to the community or the collective Somali society is a civic act in itself. Sahra Kiin Abdirahman, a Senior Livelihood Officer at Concern International and a social activist, argued that as a young woman civic engagement plays a central role in her life. She shared her views on the importance of encouraging the youth to be civically engaged. A final panellist was Dr. Hamdi Mohamed, Historian and Adjunct Professor at American University Abroad, as well as co- founder of Kaafi Research and Consulting. Dr. Mohamed discussed the need for documenting the achievements and positive stories of Somalis. She said that “the histories [of Somali men and women] have been looted”, and argued that dominant approaches to writing on Somalia focus on experiences of conflict, famine and displacement, without giving space to the many uplifting stories of men and women who rise above their circumstances and who make positive changes to their communities. This entry was posted in Comment, GENSOM, Reports. Bookmark the permalink. Trackbacks are closed, but you can post a comment. Excellent summary report from your conference! Ayaan Ahmed for president! Good detailed report. Should have larger focus on women entrepeneurship and micro-credits to help business start ups.